Violations of Rule Two can occur at the range, at the hunting camp, at the gun dealer’s counter, when removing a firearm from a vehicle, when reholstering a handgun, or even when placing a weapon into storage. I confess to failing at Rule Two on occasion. I might be cleaning my guns, and notice my wife seated across the room from me, with the muzzle of a gun laying on the table pointed at her. 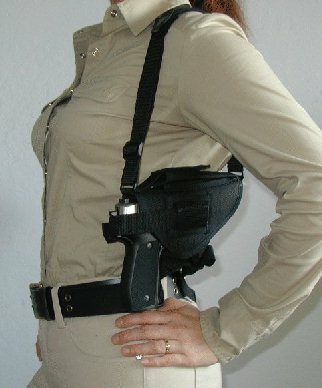 Indeed, some carry methods violate Rule Two as a loaded pistol sweeps anyone who is behind the person using a horizonal shoulder rig. A holstered pistol, or a pistol laying on a table is no danger to anyone though. It is only when the firearms are handled that the potential for danger arises. Few people have swapped stories at a gun counter and have never been swept by a muzzle by a person unaware of the transgression. Some people will duck, others will curse and protest, and still others will never notice what took place. Even so, it is surprising how many shootings are ruled accidental rather than deemed negligent homicides in light of Rule Two. Several days ago in a nearby community, some children were playing with a handgun on a street corner. I am fairly certain it was a revolver, as the news reported a .38 caliber. A young boy was shot in the chest, killed, and the shooting was ruled accidental. I feel certain the shooter squealed afterwards “It just went off! 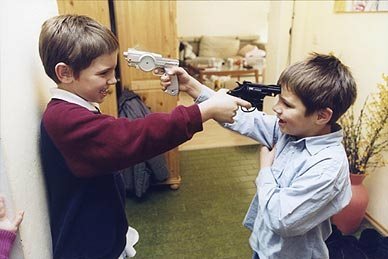 I didn’t know it was loaded!” Well, if he had not pointed the gun at his friend’s chest, he still could have had his “accident” and his friend would be alive. If a negligent discharge occurs, Rule Two is the difference between life and death. Because of Rule Two’s lifesaving, last safeguard nature, all gun handlers should strive to incorporate it into their bones. Nobody wants to kill a friend, a child, or even an innocent stranger because they were careless. Truly, all it takes is one negligent discharge to demonstrate how important Rule Two really is. Rule Two is the final safeguard that separates embarrassment from tragedy.